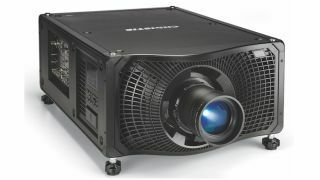 Christie has enhanced its Boxer 3DLP projector with the ability to deliver direct interfacing of 4K audio visual content, processing, and control over 10G Ethernet. The Christie Terra SDVoE input board for Boxer continues Christie’s SDVoE leadership by migrating everything onto the network, integrating all media and control onto a single system using a single cable. System solutions incorporating the Christie Terra transmitter, receiver, and controller provide complete, secure operational control and management over SDVoE systems—making it well suited for entertainment, rental and staging, and large-format display solutions as well as mission-critical environments such as government control rooms, telecommunications, the energy sector, intelligent transportations systems, and other high security environments. Featuring a web-based programming interface, the Christie Terra Controller simplifies and speeds up the installation, configuration, programming, management, and operational tasks of SDVoE systems. The redundant control configuration delivers continuous operation and system updates while the solid-state storage means no moving parts, improving reliability.